Ultraman's home planet is attacked by a mysterious evil army. 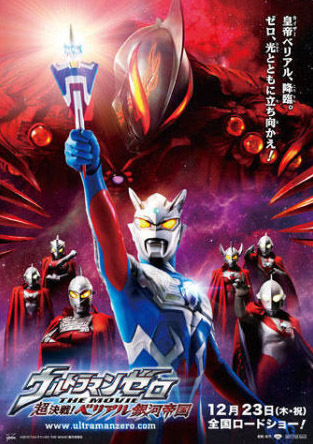 Young warrior Ultraman Zero is driven into difficulty because of his self conceit concerning his powers, but with the help of his father Ultraman Seven and past Ultraman warriors, Ultraman Zero is able to get out of his difficulties. To make amends for his past indiscretions, Ultraman Seven volunteers to go on a mission to discover the identity of their new enemy. Before Ultraman Zero begins his quest into outer space, his father, Ultraman Seven hands him the multi-purpose "Ultra Zero Bracelet". When Ultraman Zero arrives at his destination, he meets Ran (Yu Koyanagi) and his younger brother Nao (Tatsuomi Hamada). Ran was seriously injured by the evil army, while attempting to save his younger brother. Identifying with Ran's courage, Ultraman Zero merges his life-force with Ran and for the first transforms into human form.